Please remember that this is a scratch and dent item and no returns or refunds will be accepted. 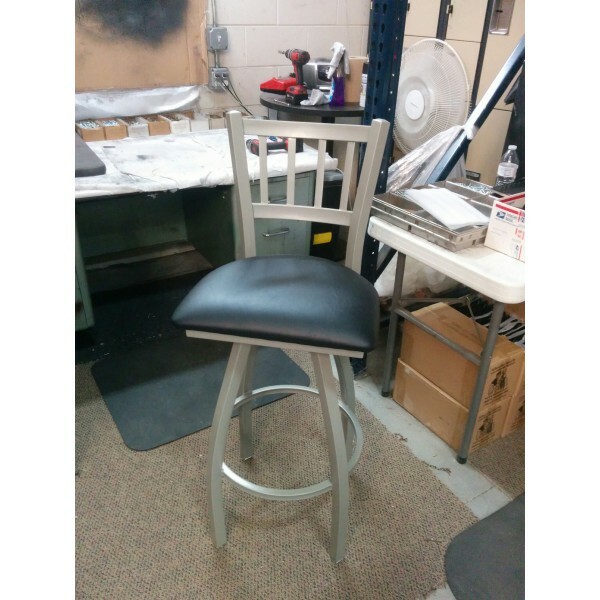 The 810 Contessa scratch and dent model is available in a 25" or 30" Counter Stool height and has a 360 degree swivel. This Stool weighs 27lbs. Once they are gone, you'll never see them again. To view an assortment of defective problems click here. This Contessa swivel bar stool has a contemporary design and provides superb back support. The frame is made from commercial quality steel that is strong and durable and has an anodized nickel powder-coat frame finish to ensure a long-lasting, rich finish. The cushion seat is of the highest quality as well, utilizing a breathable, commercial grade allante black vinyl. Underneath this is 2 1/2 inches of highly-dense foam to provide maximum support. The framework itself is very sturdy, using only solid mig welds ensuring the integrity of the structure. Please remember that this is a scratch and dent product so you will notice flaws in this product. To view an assortment of defective problems click here.